As the Fightin’ Texas Aggie Band plays during football games, the familiar sound of the “The Noble Men of Kyle” often rings out, filling the stadium with sounds of grandeur. The iconic military march, written by former Aggie Band Director Col. Joe T. Haney ’48 as a tribute to the large, brassy sound of band, is also a testament to the stately members of the Corps of Cadets and the honorable 12th Man who stands in support. Mary Haney created a charitable gift annuity with the Texas A&M Foundation. 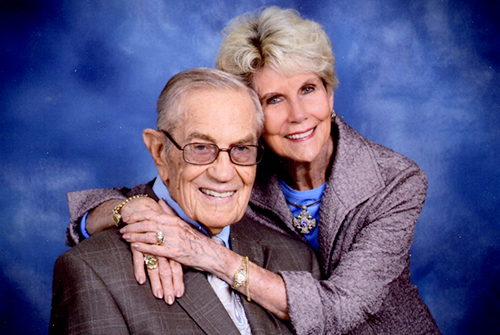 Her gift honors her husband's legacy by supporting the new John D. White '70 - Robert L. Walker '58 Music Activities Center. After Col. Haney’s passing in 2016, Mary wanted to honor his legacy by giving back to Texas A&M’s new John D. White ’70 – Robert L. Walker ’58 Music Activities Center. Now under construction at the corner of George Bush Drive and Coke streets, the center will accommodate the more than 1,300 student musicians who participate in 14 different musical groups—including the Fightin’ Texas Aggie Band, the Singing Cadets, and various orchestras and jazz ensembles. Scheduled to open in fall 2019, the facility will include four rehearsal halls, an artificial turf practice field for the band, soundproof practice rooms and ample instrument storage, thus providing a better platform for music students to practice and collaborate. Using the remaining sum of money in her late husband’s saving account, Mary established her gift by creating a charitable gift annuity with the Texas A&M Foundation. In turn, she will receive fixed payments for life and ultimately, her gift will benefit the Music Activities Center. While the stock market is liable to fluctuate, a charitable gift annuity provides you with stable payments for the remainder of your life. Additionally, a portion of your payments may even be tax-free. Individuals also have the option of a two-life gift annuity, which pays fixed payments to the donor as well as a spouse or other beneficiary. For those who aren’t ready to begin receiving income until later in the future, a deferred gift annuity allows donors to receive payments as a designated future date. 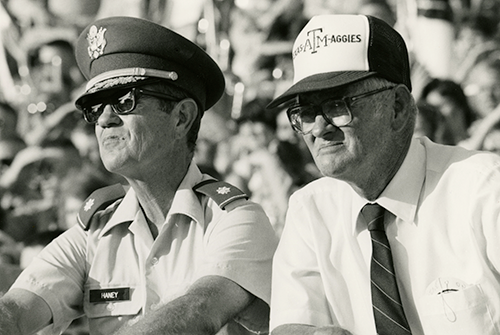 Col. Joe T. Haney '48 (left) directed the Fightin' Texas Aggie Band from 1973 to 1989. He wrote one of the band's signature marches, "The Noble Men of Kyle." For the first time in more than six years, the American Council on Gift Annuities announced that rates for charitable gift annuities are increasing, effective July 1, 2018. For example, the suggested rate for a 79-year-old annuitant will increase from 6.6 percent to 7.1 percent. During his tenure at Texas A&M, Col. Haney oversaw the integration of women in the Aggie Band and created the University Symphonic Band for students who wanted to play, but didn’t want to be in the Corps of Cadets for the marching band. These actions opened the doors for many more Aggies to participate in instrumental ensembles.